Such things make me shriek like Nicole Ritchie, all smoked up, seeing flashing lights in the rear view mirror. And then we both grab our cell phones and call our publicists (Nicole: “Um, yea, so I smoked some pot, and then took a little blue pill, and I really had to drive because I absolutely had the munchies, but I can’t actually eat anything cuz I already had my tic-tac today, so I thought maybe I’d just go stare at the Hollywood sign and think about how it looks like it could be made of Twizzlers.” *** Me: “Omigod, I totally just slapped that Texan housewife when she told me I should wear more gold. How can we spin this to The Duluth Tribune?”). But what if my publicist is out for cocktails at PURE with Pamela Anderson and Jamie Foxx and doesn’t pick up? What to do then? Well, I could assuage my fears by attending a calming yoga class, right? I mean, through controlling my breathing and working through a series of sustained poses, I could cleanse my chakras and free myself from the willies engendered by women who wear too much make-up; I could re-center; and I could get back to what’s important (like how the Hollywood sign looks like it could be made out of Twizzlers). 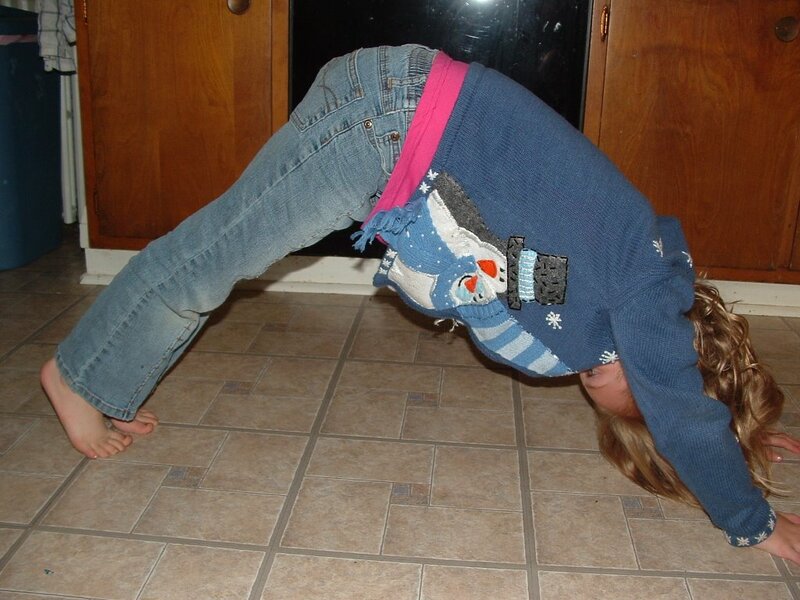 So one day, after a run-in with a headless Barbie (that’ll teach me to vacuum under the beds), I was forced into an emergency visit to yoga class–all I needed was that reliable, gentle atmosphere and a few warrior poses, and the mantra of “no head, no head, Skipper had no head, no head, no head, but she had on excellent pumps, but no head, no head, no head” would be banished from my brain. Upon entering the room, I noticed the teacher had not yet arrived, so I spent a little time sniggering at a couple of the other class attendees (not so very yogic of me, I concede), especially the woman in full make-up, sporting a sternum full of jewelry and one of those off-putting coordinated gym outfits. What the pajeebus is up with women like this? Naturally, I assumed she was a Texas housewife, visiting the city to see how we do our downward dogs north of Ye Olde Mason-Dixon line. Suddenly, however, this woman reoriented her mat and welcomed us all to class. Wait a Mary Kay minute, but she was the teacher! After a few words to greet newcomers and a couple tips on how to use a flatiron for best effect when straightening hair, Mary Kay Yogi started class. 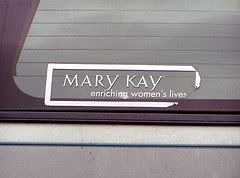 that photo of the partially torn Mary Kay bumper sticker is such a poetically ironic image. great post. i’d like a poster of this post. We have alligator on a stick here too. I miss the MN State Fair. I don’t get nearly enough foods on a stick. If they did a contest asking for recipes on a stick, I would totally win. I’ve got lots of ideas. Van–You make me very happy. I was thinking the same thing about the bumper sticker (now I’m glad I soldiered on when placing it into the post became a huuuuuugggge, ongoing hassle). I’ve tried getting to your blog, btw, by clicking on your name here, but it says your profile hasn’t been revealed. Man of mystery! Mist 1–Now you know I have to ask. Like *what* on a stick? Give me your brainstorm, and perhaps the State Fair kingdom will be yours. Ah, got it, Van. Faceless confusion is now cleared up. ok, i’ll stop, sorry for the confusions. “alligator-on-a-stick”… is this some kind of “delicacy”? 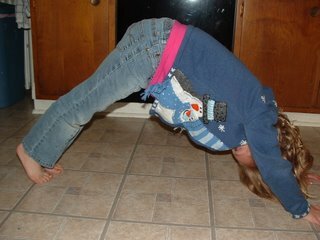 I keep thinking that I should try yoga, that it would help me focus. On the other hand, when I did Tai Chi, at the end of each class, I’d stand on the sidewalk and literally scream in frustration. I guess I’m not so slow and controlled. OH, and YES! finally we can read the coy and mysterious Van! I would have thrown up…give me a break…give me a headless barbie doll….et al….lol …funny stuff! Yoga teachers wearing makeup? What’ll they think of next, rapping accountants? oh dear, i’m afraid you are not gonna like some of my barbie art. sorry about that too, in advance. and i too get lost in a paper bag. hysterical! thanks for visiting! i fall asleep in yoga- i can’t do it. I like pilates though. Nicole Richie is a train wreck- poor thing. Yee Haw doesn’t seem like the right thing to yell after a yoga session, does it? At any rate, this made me laugh…which helped me relax after a long day. Thanks! I heard from an ex-Witness that all you have to do is tell the white shirts that you were ex-communicated by the church. They’re forbidden by the church to talk to you. Thought that might help. Some people just need a slap – it’s a law of the universe – in fact, I think there’s even an asana for it.